Spend your vacation at 'Summer Breeze,' a beautifully furnished, former -BDA model home with many extras. Stroll over to the wide, sandy beach, only a five-minute walk with easy beach access. We rent from Sunday to Sunday for the week. The top deck provides unobstructed view (360 degree)of the area. You are able to see the ocean, sound, Currituck Lighthouse and the beautiful Currituck golf course.In the evening enjoy a beautiful sunset with possible sightings of deer and fox. After darkness falls enjoy the spectacular sea of stars and the blinking of the Currituck Lighthouse. This home is loaded with lots of extras that you won't have to pack to bring with you: LINEN AND TOWELS FOR 16 PEOPLE, 1 BEACH CART(Push type),umbrellas, beach chairs, boogie boards, and sand toys. All the bathrooms have wall-mounted hairdryers for your convenience. There are six TVs, two VCRs, and six DVD players. All bedrooms have clock radios with CD player, and the recreation room has a stereo unit and a foosball table. Also, a mini frig is located on the lower floor to allow easy access to drinks while using the pool and hot tub. There are baby furnishings (pack n play, porta crib, 3 high chairs, 2 baby gates, 1 booster seat), books, games, and puzzles. In addition, a game table for playing chess, checkers etc. is located in the loft area. There is also a sitting area on the middle floor for reading or relaxing. There is a long driveway for rollerblading, and the driveway also serves as a canvas for your youngsters work of art using sidewalk chalk. There is also a huge lawn to play on. Bedroom with 2 pyramid beds each with (double on bottom and twin on top ). Rec.room with wing arm chair and wrap around queen sleep sofa, (42 inch TV, Stereo,surround sound and outdoor speakers for pool area. This level has a closet which contains baby eq. Bathroom with access from inside house and the pool-hot tub area. Outside shower. There is a park grill and a fish cleaning table outside the pool area. THE POOL IS PROTECTED: by a high fence and 2 gates with latching device. In order to open the gate you must reach over the top of the gate. This prevents small children from entering the pool area. The pool area also has outside speakers to listen to the sound of the beach. Bedroom with king and priv. bath,TV, pvt. access to deck rear of house. Bedroom with queen and priv. bath, priv.access to deck rear of house. Bedroom with queen bed and priv. bath,TV. pvt.access to front deck. Washer and Dryer. There is a sitting area for reading or checking email with internet. It also has access to the rear deck. The rear deck on this level contains a porch swing which has been a popular spot. There is a 1/2 Bath between the 2nd and 3rd levels. Bedroom with king and priv. bath,TV, pvt.access to rear deck, full kitchen, dining room and great room, TV. . Access to front deck and rear deck. Gas fireplace. Beautiful views from the this level. Lots of deck furniture on this level. A screened in room with access from the king bedroom and the deck overlooks the Currituck Golf Course (Tee #3)There is an observation deck with wonderful views of the ocean and sound. You will be amazed with the views from this level. Access is by stairway off the rear 3rd level deck. The loft area is a nice get away spot to read and unwind. There is a game table on this level. There are ocean views from the loft. Each floor is controlled by its own thermostat. Enough parking area for up to 6 cars in the driveway. A large selection of paper back books. Amounts vary, but probably 150 books for your enjoyment. Phones, Central Air Conditioning and Heat, VCR's, CD Player's, Ceiling Fans In All Bedrooms And Greatroom', Bocce Ball, Volleyball,, Mini-Frig in the Lower Level, Crabbing equipment, Game Table For Playing Chess, Plus much more!!! Also, a pak-n-play and a portable crib for babies. There are 3 highchairs and booster seats. There are 2 babygates that can be used where needed. All we had hoped for and more! This was the first time for our large family to come to the Outer Banks, so we were unsure where to stay and what to expect. Janet was great answering all our questions, which put our mind at ease. Summer Breeze is wonderfully located on a quiet golf course, which gave us privacy when the children were swimming and being loud. The walk to the beach was easy, even for the little people. The house is very well stocked with linens, kitchen items, high chairs/pack-n-play, beach chairs, boogie boards, and even carts to haul your things to the beach. The dining room table was HUGE and easily accommodated our group. The kitchen island is large and great for 'buffet style' meals every night. The upper deck gave beautiful vantages of both sunrises and sunsets. Corolla is lush and green, but very close to shopping Harris Teeters was less than a mile from the home, which made it convenient when we suddenly realized we were out of milk or produce. We couldn't have been happier, and hope to come back again. Thank you for taking your time to give our home such a wonderful review! We appreciate it, and are very pleased that you and your family had such a great vacation. We would be happy to have you return! My family traveled from New York, Pennsylvania and Georgia and had a wonderful, relaxing week in this home. We spent every afternoon in the pool and the beach is about a 7 or 8 minute walk from the house. It is close to shopping, mini golf and restaurants. The house was very clean and well stocked. Everyone had plenty of room to spread out. Would definitely book again! Thanks for the great review...we are so happy that you enjoyed our vacation home. Please keep us in mind for a return visit to the OBX. We truly enjoyed our week at this beautiful home. The house is clean, spacious and comfortable, and the owners have it stocked well with any possible need you may have. The pool is large, and the hot tub is relaxing. It's just a short, easy 5 minute walk to the beautiful beach. I enjoyed my peaceful morning walks on the paved walking/biking/running trails along Ocean Trail every morning. 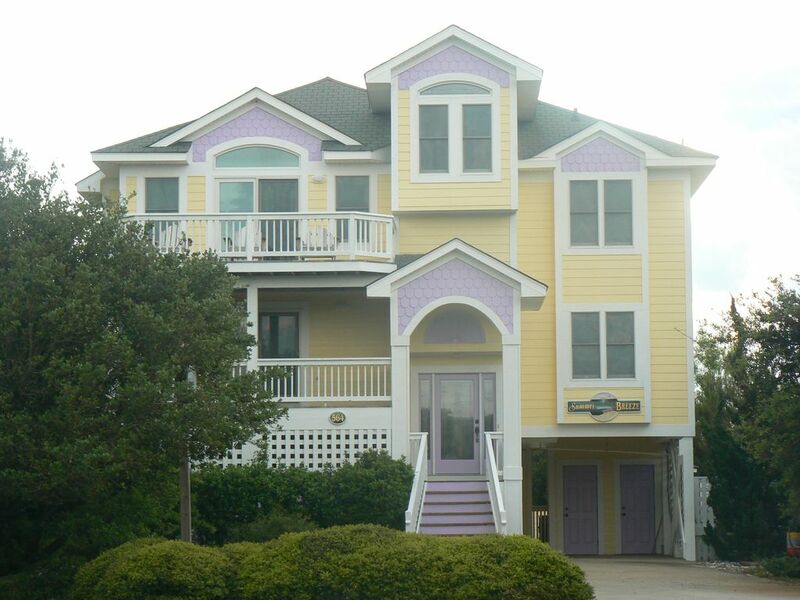 This is our favorite house we have stayed in on the OBX. Can't wait to return! Thanks for the great review....We appreciate your kind words. It was good to hear about the new walkway. It is definitely a wonderful addition to the area. Thanks again...see you in 2017. Absolutely loved our stay here! Kids enjoyed the pool and hot tub. There was enough room for all to have our own space. Short walk to the beach which was very clean and not so crowded. The owners are very personable and were available for all questions and concerns. Would highly recommend for anyone looking to spend a relaxing vacation! This home was fantastic for a group with children. The pool was so much fun for our children. The Adults enjoyed the hot tube as well as the pool. We all had plenty of room for the large group to spread out. All rooms were clean and comfortable. I also was so happy that the beach was a short distance from the house. With 6 small children, I do believe is would be dangerous for us to keep a safe eye on all children. I would recommend this house to anyone with a group of children. Beaches were fantastic. Outer Banks was a enjoyable family vacation.